Afraid of visting the dentist? Sedation Dentistry may be for you! If visiting the dentist makes you feel anxious, you are not alone. 75% of Canadians say visiting the dentist makes them think twice about staying on-track with their regular dental hygiene and examinations. At Point McKay Dental we care about ensuring that you experience complete comfort during your dental visits, which is why we offer NW Calgary Sedation Dentistry options! What Sedation Method is Rest for Me? When considering which type of sedation method is right for you, we conduct a thorough examination that includes discussion regarding your past medical history, the current prescription medications you are taking and discuss the risks associated with undisclosed recreational drug use and the method of sedation used for your visit. We suggest that you bring a detailed list of your medical history, including any medications and nutritional supplements you may be taking to your initial consultation. Sedation Dentistry allows people with dental anxiety or fear of the dentist regain their confidence in the importance of regular hygiene and periodontal treatments. Routine dental care, such as dental hygiene visits are essential when preventing the onset of more complex dental problems. Following a routine care and maintenance schedule helps our patients avoid the very thing they fear — with fewer visits to the dentist! 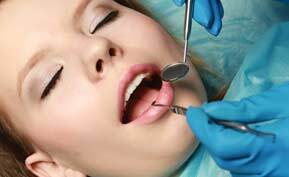 Sedation dentistry is considered to be very safe. At Point McKay Dental, we ensure the safety of our Sedation Dentistry patients by using monitoring equipment during the procedure, which includes a pulse oximeter and oxygen equipment. Our Dentists are also required to have reversal medication agents on hand in the rare case of an adverse reaction to the sedatives. Patients undergoing sedation dentistry services are required to have a responsible party drive them to and from their appointment and remain with them until the effects of the sedation have passed. Is Sleep Dentistry the same as Sedation Dentistry? The term “Sleep Dentistry” can be misleading. When we use sedatives, you are not actually asleep, although you may feel very sleepy, which is one of the effects of the sedatives. The term sleep dentistry is often connected to the use of general anesthesia. Most dental insurance plans typically do not cover the cost associate with sedation dentistry. Since every dental plan is unique, we ask that you contact your dental insurance company to determine if you may be eligible for coverage. At Point McKay Dental, our dental team can assist you with this process and with making the necessary financial arrangements. We welcome you to contact Point McKay Dental, NW Calgary Sedation Dentist, to book your consultation appointment today. Call us at (403) 283-7829 to book your Sedation Dentistry Consultation with us today!